Antique Vintage Oak Writing Desk Bureaux Cupboard Marriage Of Pieces NO RESERVE! We have for sale an unusual antique Edwardian bureaux with Georgian panelled doors and locks. This is an interesting mix of styles which were put together in the early 20th century from older pieces such as the oak doors which are George III or earlier. Age related Marks, full of character, lovely pattern and colouring. All drawers and desk supports in excellent condition and slide well. 19th Century Mahogany Bureau with 5 drawers and opening desk. Overall quality and condition is good. A small burn on the top surface, 2 very small pieces of veneer missing and slight scratching as expected. If there are any further questions, please feel free to contact me. Very good condition. size is H-47" L-34.5" D-20.5". T hi s beautifulVictorian pieceh as s to od u p we ll f or i ts a ge a nd u sa ge. An d wh en t he desktop is r ai se d up i nt o the cl ose d position, t he s up por t ar ms g en tl y re se ed b ac k in to the c arc as s as i f th ey w er e ne ve r th er e. S tu nn in ge xa mp le o f Victorianingenuity. Poorly fitted velvet effect writing section. This is for a very nice Antique Mahogany 4 Drawer Bureau, lovely period piece probably dating from the late Victorian/Edwardian period. Collection from Bow, nr Crediton or Inwardleigh, nr Okehampton, Devon. Antique mahogany bureau 107 wide 53 deep 111 tall Good condition for age Complete with secret drawer! With blind panel top, fitted interior and four drawers. The photos make it look much worse than it is. 40.5" high - (30" high to desk top). 11"deep -(15.25" deep frompigeon hole to front of desk). In good general condition with historical wear, knocks, marks in conjunction with an antique of this age. Collection only. Width 44in. Depth 20in. Height 67in. A George 111 Tilt Top Tripod Table. 28.5" high - (30" high to desk top). In good general condition with historical surface wear, knocks, marks in conjunction with an antique of this age. This secretaire features 2 drawers above a fall front and 3 drawers all finished with later cup handles. The lockable fall front opens to reveal a beautifully fitted interior with 4 small drawers and a cupboard with an internal drawer. Beautiful arts and crafts writing bureau, stained glass window is very slightly damaged. Really unusual elegant item in very good condition other than the damages to the glass, which if repaired would look stunning with a back light. Both cupboard section and writing section are lockable and we have the key. DO NOT PAY THROUGH PAYPAL PLEASE. Dimensions - width 106 cm height 178 cm deep 33 cm All measurements inc taken at largest point and include cornice. Pay on collection NO PAYPAL thank you. Sign of inactive woodworm on the back, but as always it would be best to treat it again. Antique Heavy Oak Writing Bureau. Lovely, solid and heavy piece. Plenty of storage. Locks from the flap part and drawers are missing. Late Victorian Mahogany Writing Bureau. We have owned this delightful little bureau for approx 8 years & have decided to sell due to lack of current space. The item was purchased from an Antique centre & described as Georgian Mahogany which I cannot confirm to be 100% correct but the piece certainly has good age & quality. The bureau has been kept in storage for the last 6 months so does require a little work to bring it back to its former beauty. The dimensions are approx 760mm/30" W 970mm/38" H 230mm/9" D (top) 460mm/18"D (bottom) It has a 2 keys one of which unlocks the front & the other locks the centre internal compartment. Please call me (Steve 07964 043364)or message if you require any further information Collection is from Cornwall! Depth 21" 54cm. The drop down writing surface with its green beize insert is in excellent condition. Overall Height at rear 44" 112cm. Writing surface 31" 79cm High. Fitted one shallow and three long graduated drawers with dovetailed jointing and solid plank interiors. The fall flap enclosed writing surface, banks of graduated drawers, drawers above cubby holes and a miniature cupboard enclosed storgae. Circa 1900. Original handles and locks to all drawers, original hinges on the fall front. Standing on bracket feet. Get Supersized Images & Free Image Hosting. Reduced!!! Need quick sale due to space. Beautiful walnut rolltop secretaire. Very well looked after, excellent condition for age. Slight split along back corner (see pics). Solid and sturdy. Newly waxed. to the photographs for clear item condition. Stands on 4 barley twist legs with shaped and carved front rail. That said, I have been perfectly happy with it for many year as it is. It holds quite a lot of stuff and looks pretty in a traditional setting. The shaped top has an integral moulded edge. The two bookcase doors are clear glazed with leaded panels with small details in pink textured glass, the bookcase is fitted with a single adjustable shelf and has a painted back board. 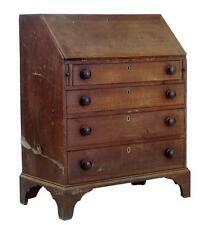 Antique oak small Bureau with two drawers. This has been recently renovated and painted in Farrow and Ball Stiffkey Blue with gold embellishment and French themed stencil. Internal storage comprises six pidgin holes and a small drawer. no repairs or dents. Two deep drawers with brass handles. Attractive moulding to base. No key. Lock complete. H-97.5cm W-79cm D-41cm. Deliver available within a 30 mile radius. Price on request. Please see all seller’s other items! Gorgeous Painted Carved Bureau with two interior drawers and one larger exterior drawer. Painted green and aged to highlight the carvings. This is is a delicate and very pretty ladies writing bureau on cabriole legs. Antique Late Victorian Walnut Davenport Desk. A Lovely period walnut davenport. ideal for any period property. The sloping tooled red leather (original) covered writing surface conceals a fitted well with a birdseye maple veneered interior, completed by 2 removable divided pigeon holes. Antique Edwardian Mahogany Davenport Desk. ideal for any period property. This Davenport features a lovely deep rich Mahogany colour which is contrasted by its fantastic polished brass gallery and handles. England: £30-£120 depending on item size and location. ===========================================. Ireland £150. Beautiful Very Unusual Late Victorian Solid Pine Secretaire. Beautiful Late Victorian Solid Pine Secretaire. Woodbine Pine. It is in lovely condition, a very unusual piece and a rare find! and all our other furniture and unusual pieces. Woodbine Farm. or call for any further information. Edwardian upholstered parlour chair. ===========================================. Ireland £150. England: £30-£120 depending on item size and location. A superb mid to late 19th century French Bureau. 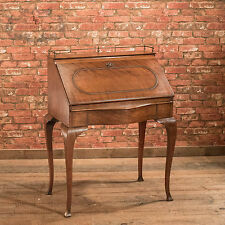 ::: Angilou Genuine French Furniture :: A pull out writing surface with leather writing surface. However, we do mainly deal in Antiques and second hand lots. THE BASE IS MAHOGANY WITH PINE STRETCHERS ON THE INSIDE. IT HAS TWO LONG SOLID WOODEN SHELVES WHICH CAN BE ADJUSTED WITH THE RATCHET SYSTEM ON THE SIDES. (see photos). THE WRITING SLOPE PULLS DOWN WITH BRASS HINGES AND A KEY TO LOCK THE BRASS LOCK. Hi for sale I got this beautiful Rwal wood Mahogany Writing desk bureau.I have found only replica of one like this(£499) but couldnt find any oryginally made.Alot of details suggesting that this one is oryginall but as Im not an expert and I could only find very little information about this lovely piece of furniture I wont be able to confirm how authentic it is but if it is a replica then whoever done it done great detailed job.It have few age marks and scratches, some of draws needs a bit of attention(bottom of some are comming apart)and there is few repairs done at some point pls see last photo.Im open for sensible offers.Thank you for looking any questions pls do not hesitate to contact me. Solid and sturdy piece. Needs a bit of TLC. A Superb Aesthetic Victorian Two Door Ebonised Bookcase, circa 1880. The top section with two glazed doors opening to two shelves and with a lovely arched top with finials. The bottom section has two drawers above two cupboard doors. A lovely large antique oak cylinder bureau bookcase. We date this bureau bookcase to the late 19th century. The bureau bookcase comes in two sections, the cylinder bureau base and the bookcase top. The bureau sits on a plain plinth base. The bookcase section sits on top of the bureau and is screwed together. The bookcase is fitted with an integral stepped cornice. The front of the bookcase is of two panel design with each panel being a side hinged door. The doors are glazed with glass panes. The right hand door is fitted with a working lock (key supplied). The left hand door is secured with rear mounted bottom lever bolts. The interior of the bookcase is fitted with three height adjustable full width wooden shelves. The base bureau consists of a cylinder front over a large cupboard. The cupboard has a full width interior shelf. Has locks and key. Brown leather inlay. Automatic arms when top lowered. With original brass handles. Inlaid with satinwood, ebony and boxwood. Writing height of 28”. This is an antique secretaire chest of drawers dating to the Victorian era c.1850. The second drawer opens on superior quality brass hinging to reveal the writing desk complete with inset green baize surface, a series of six cubbies that are flanked by banks of triple drawers and beneath two further, each showing kingwood veneer and accessed with modest turned pulls.